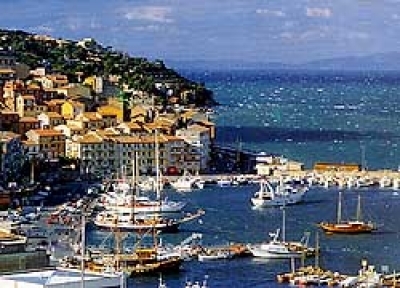 Porto Santo Stefano is located in the municipality of Monte Argentario, in the Province of Grosseto, in the Tuscany region of Italy. It is situated in a picturesque bay and it is not only an important centre for fishing and an animated bathing resort, it also absorbs the conspicuous movement of holiday-makers who leave from here for the Island of Giglio. It is certain that this bay, sheltered from the winds and sited midway along the Tyrrenian coast, was used by ships ploughing the Mediterranean even in ancient times. Only when Elban and Ligurian fishermen began to settle here between the XV and XVI centuries did a real urban agglomerate begin to take shape. Decisive moving force was given to urban development when, subsequent to the transfer of authority from the Republic of Siena to the Spanish controlled Stato dei Presidi in 1557, the Spaniards decided to make Porto Santo Stefano the base for their powerful mercantile fleet trading along the upper and central reaches of the Tyrrenian coast. As the Argentario was in such a strategic position, a series of coastal watch-towers were erected to defend it. One of these, the Fortress is, today, the town's most interesting architectural nucleus.